Have you ever heard of plant sterols (or phytosterols)? They’re a small but powerful tool in the quest for a healthy heart. Plant sterols are a naturally occurring ingredient that’s known to partially block the absorption of cholesterol in the digestive system when 2 grams are consumed daily as part of a healthy diet, low in saturated fat. That’s important because even small reductions in cholesterol can have a significant impact on heart health, particularly when achieved at an early age and maintained over the long term. Plant sterols and cholesterol have a similar chemical structure. This similarity means they compete for absorption in the small intestine – so in a way, the plant sterols actually stop the cholesterol from being absorbed. And yes, this is proven. A recent analysis of 40 clinical studies available shows that we can expect an LDL cholesterol reduction of up to 9% in four weeks if we ate 2 grams of plant sterols each day1. Plant sterols are found in a variety of plant foods like grains, vegetables, fruit, legumes, nuts and seeds, but only in very small quantities. Sure, you can increase your intake of plant sterols by eating more of these foods that contain them; however, getting the efficacious amount needed can be a challenge. To put things into perspective, in order to get 2 grams of plant sterols from a kiwi fruit, you would need to consume 500kg! 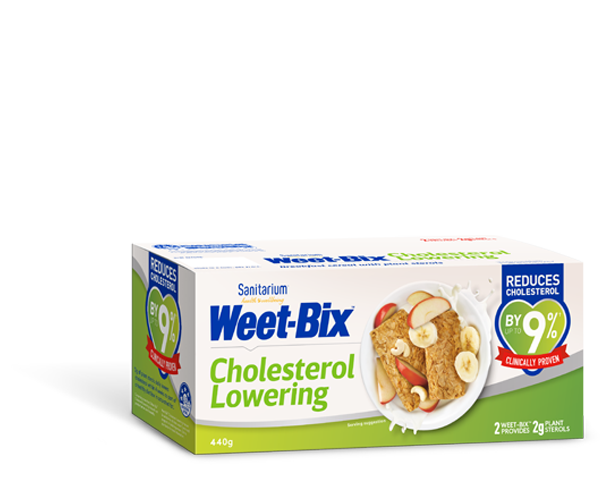 Safe to say, it is not possible to meet the recommended daily intake to lower cholesterol without plant sterol enriched products. Plant sterol enriched products are essentially foods that have had sterols added to them. When it comes to cholesterol lowering, the most effective dietary strategies are to replace saturated and trans fats (bad fats) with unsaturated fats (healthy fats), and increase your intake of plant sterols each day as part of a healthy diet. These two strategies account for the majority of the cholesterol lowering effect that is achievable through diet. To help ensure the recommended intake of sterols is consumed from enriched foods, checking the nutrition panel is important. Food manufacturers are required to state the total amount of sterols per serve in nutrition panels of enriched foods.